By the time Sean and I launched our National Parks adventure in 2011, we had driven through Cuyahoga Valley together and he had previously visited one Park (Dry Tortugas) and I had visited four (Grand Canyon, Yosemite, Shenandoah, and Badlands). In the intervening years, Sean had picked up Badlands during our 2014 trip to the Dakotas. When he asked what I wanted to do for the National Park Service’s 2016 Centennial, I said that I wanted to catch up and calibrate so that by the time the year ended we’d both have been to the same Parks. No longer would we have to say, “I’ve been to eleven and he’s been to nine” or some such. Focusing on the four catch-ups and adding on some logical companion Parks as we went meant visiting eight Parks in 2016, ending the year at a twenty-two Park total, not bad for the first five years of the sixteen-year journey. Our friend Patrick, who is a professor of art history at the University of Chicago, was on his pre-tenure sabbatical year doing a Getty Fellowship in Los Angeles. We decided to craft an eleven-day trip that would include spending time with Patrick in L.A., visiting Disneyland since Sean had never been, and hitting two National Parks: Yosemite and Channel Islands. 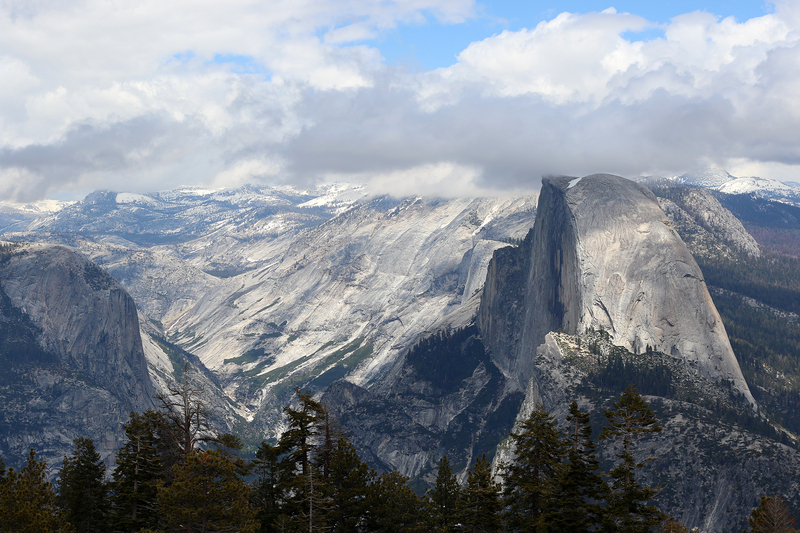 The complete trip was from May 20 – 30, 2016, with the Yosemite portion falling during the week before Memorial Day weekend. We flew into L.A. on Friday, spent the weekend in Brentwood with Patrick, drove down to Anaheim Sunday afternoon for Disneyland Sunday evening and Monday, and then on Tuesday drove to Yosemite for four nights of camping. On Saturday morning we returned to L.A. and on Sunday took a day trip to Santa Cruz Island before returning home to Chicago on Monday afternoon, Memorial Day. Much of our time in Yosemite was up in the air…far more so than usual for a National Park trip. Usually I have mapped out a solid general outline day by day of hikes or other things to do. But in going to Yosemite in late May, definitely shoulder season for the park, any itinerary would be hugely impacted by whether the roads into the high country (Glacier Point Road and the legendary Tioga Road) would be open. Glacier Point Road did open in early May and the Tioga Road opened the week before our trip. Then because of a storm system that moved through the weekend of May 20-22, both roads closed again. When we arrived at the Park, they were still closed. The only thing I knew for sure that I wanted to do was a long, leisurely walk in Yosemite Valley. The idea was to park at the Bridalveil Fall parking area on the western end of the Valley and leave the Jeep there for the day, walking perhaps all the way to Mirror Lake in a huge, grand day-long loop, experiencing the Valley at a human-scale walking pace rather than from behind a steering wheel. Beyond that, a visit to one or both of the open Giant Sequoia groves (Mariposa Grove is closed for restoration until 2017) and perhaps a waterfall hike (the Mist Trail to Vernal and Nevada Falls or the Yosemite Falls Trail) rounded out the plans in my head. As for accommodations, we scored a campsite in Hodgdon Meadow Campground, about forty minutes up the Big Oak Flat Road from the Valley. As soon as I’d clicked the confirm button on Recreation.gov for the site, I got very excited for the sights, sounds, and smells of Yosemite, which were still vivid in my mind from my first visit twenty-three years earlier. This entry was posted in Journey and tagged California, Yosemite on June 3, 2016 by Brandon Hayes.